News » Strong Revenue Growth Highlights Impressive Year for AnalytixInsight Inc.
Strong Revenue Growth Highlights Impressive Year for AnalytixInsight Inc. The financial results for AnalytixInsight Inc. (TSXV: ALY – $0.39 & OTC: ATIXF – $0.31 & Frankfurt: 1JX – €0.24) were released this week for Q4 and full year 2017. Crunching the numbers, it’s clear that the Company is on the right track after achieving notable improvements for several key indicators of operating performance. Overall, the financial results demonstrate the best year in the history of the Company. The corporate guidance has also highlighted important developments in the pipeline that are encouraging for the future. The heart and soul of the Company is its innovative Artificial Intelligence (AI) based big data analytics platform engine that is able to process large amounts of data. The platform subsequently interprets this huge volume of data to auto-generate reports for ease of consumption by end-users. In addition, it has predictive analytics capabilities. The Company’s product and technology platform is used to service its three divisions: CapitalCube, Euclides Technologies, and Marketwall. These entities in turn, service a variety of customers across both the individual and institutional segments. The strong increasing demand for these types of services is demonstrated by the year-over-year financial performance of AnalytixInsight. During 2017, the Company achieved revenues of $4,516,759. This represented a rise of more than four times the previous year revenue of $1,075,349 and about ten times the revenue reported in 2015. The gross profit of $2,039,863 in 2017 also compared favorably with the prior year, increasing by more than 400 percent during the period. It also appears that this rapid growth rate can be sustained as more corporate customers recognize the potential from machine learning technology and the value of real time data analysis. This is illustrated by the contract order backlog for the Euclides division that already stands at $4.5 million. Note that this is as high as the Company’s total revenue in 2017. Euclides accounted for $3 million of the total revenues for the Company during 2017. Net earnings are also trending in the right direction. From a full year loss in 2015 of $2.62 million ($0.07 per share), the bottom line improved to a loss of $1.36 million ($0.03 per share) in 2016. For 2017, the Company reduced the loss even further to $864 thousand ($0.01 per share). AnalytixInsight finished fiscal year 2017 with $1,903,865 in working capital. The Company’s wholly owned subsidiary Euclides Technologies Inc. based in Cambridge, MA, is an expert system integrator for WorkForce Management (WFM) and field service management businesses. Euclides has a proven track-record of expert services and successful implementations, as well as a large client base with worldwide customers representing over 100,000 field service personnel across multiple industries. These range from Power and Utilities to big box retailers that deploy field personnel. Following the acquisition of Euclides, in March 2017, the Company started integrating the WFM modules into its existing AI machine learning platform. This will empower WFM companies to increase efficiencies of their large-scale operations through performance data tracking, quality control tools and solutions that may be leveraged across verticals to optimize workflow and performance. The suite of financial services and products are developed targeting Fortune 500 companies. A second division, CapitalCube.com, is a cloud-based platform geared to provide analysis of more than 40,000 stocks and ETFs. The services include company analysis, portfolio tracking, and stock screening tools, functioning as an online portal that can be tuned to deliver comparative reports for corporate data. CapitalCube’s institutional partnerships with leading finance portals like Yahoo! Finance and the Wall Street Journal have increased awareness and driven additional traffic to CapitalCube’s individual customer segment. Additionally, CapitalCube currently supplies value-added financial analysis and content through its machine learning platform to stock exchanges in Europe and Asia, and powers their financial portals. For example, it is now live on the Euronext stock exchange, serving European investors through the cities of Amsterdam, Brussels, London, Lisbon, Dublin, and Paris. CapitalCube is in discussion with large financial institutions to provide custom reports and analysis. The division is expected to contribute to grow as the Company adds more customers and content distribution partners. 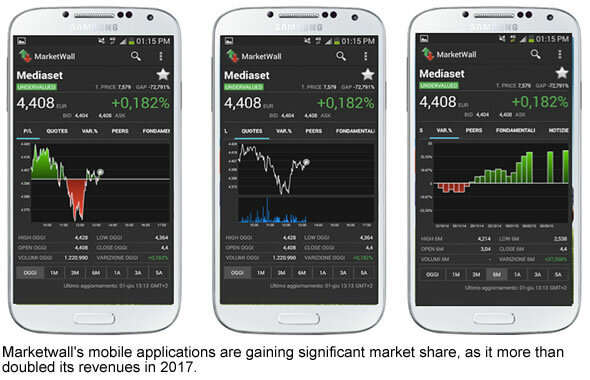 MarketWall, a third business unit, develops mobile applications that are currently available on Google Play and iTunes. It has a partnership with Samsung to load its applications on Samsung’s entire suite of mobile products, wearables and Smart TVs. In addition, thanks to its partnerships with leading financial data and news providers such as Morningstar, it was able to close a five-year licensing and integration project with Intesa Sanpaolo, one of the leading financial institutions in the world. As part of the project, Intesa Sanpaolo will incorporate Marketwall’s mobile capabilities with their existing product and service portfolios for their retail banking customers. As Intesa Sanpaolo currently owns 51% of MarketWall, it is considered an associated company and therefore not reported within the consolidated financial data of AnalytixInsight. MarketWall generated revenue of $4.2 million, up 147%, compared with revenue of $1.7 million in 2016. Moreover, for the first time, the division was profitable in 2017, with a net income of more than $1.1 million, versus a loss of $.4 million in the prior year. Management has indicated that it intends to spin off this division as a separate entity to be listed on a European stock exchange, but no firm date has been announced for this transaction. As a feather in its cap, based partly on the strong performance of the Company during this transformative year, AnalytixInsight was named among the elite ranks of the Venture 50 representing the top ten companies in each of the five major industry sectors trading on the TSX Venture Exchange. The ranking criteria for selection included return on investment, trading volume, analyst coverage, and market cap growth. AnalytixInsight has achieved a breakthrough during 2017 as growing demand from its customer base for its analytical services has translated into sharply rising revenues. This strong trend clearly continues, as demonstrated by the reported contract backlog for the Euclides Technologies division. Perhaps the Company is positioned to make the transition to net profitability in 2018? Management has outlined objectives to continue building the customer base, and the development of new customized analytical products will contribute to additional growth opportunities. The market demand for information services is still early in the curve, but the Company has also identified other sectors for potential expansion using its proprietary analytical software platform, including social media, retail, and gaming analytics. The improvement in the operating results, along with strong growth prospects for the future, have served to reduce the overall risk level for investors and built the foundation for creation of solid shareholder value. Recommendation: BUY. For important disclosures, please read our disclaimer. Sign up for our weekly e-mail newsletter and be the first to receive our best ideas and updates. No spam. Unsubscribe at any time.